Indira Chandrasekhar is the founder/editor Out of Print, a highly-respected online journal that publishes short stories. Indira Chandrasekhar returned to India after a say of seventeen years abroad. She started writing fiction with an increasing focus on the short story upon her return to India. She is a scientist by training and a fiction writer by inclination. Short stories occupy a precarious space between flash fiction and novels. Where flash fiction can get away with the depiction of a moment in time and novels span lifetimes generally, short stories are expected to perform from the first line and provide a sense of change within the limited canvas available to it. 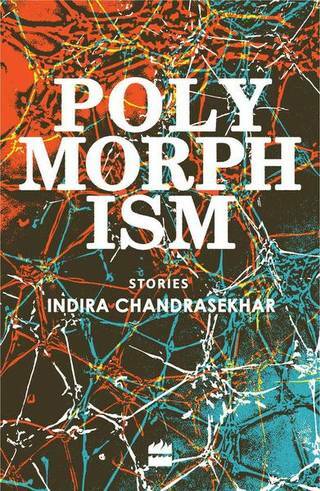 In her debut collection of stories titled Polymorphism, Indira Chandrasekhar has played with the short story form. So there are stories that focus on a moment in time as also stories that follow the lives of characters through their lifetime, like a longer narrative. The stories vary in length, with the shortest story taking about three-and-a-half pages while the longest takes about 13 pages. In the former, news about a pregnancy turns life around for the narrator while in the latter, pregnancy and childbirth bring about unforeseen changes. Family dynamics, especially relating to the presence of children, is a recurring motif in many stories, almost a loose binding that holds this eclectic collection of 19 stories together. The first story in the book, which also lends its title to the collection, starts with an incident that becomes the canvas to detail the uniqueness of the main character. A thief riding a scooter robs a woman out on a walk of her handbag. Her arm gets dislocated and we learn that the loss of the bag also means the loss of medicines she’d kept in the bag. What were the medicines for, and what is the significance of her injury? As the story progresses you realize that these questions don’t matter because the narrative has moved on purposefully towards other realities that the reader must process. Chandrasekhar’s command over craft and the narrative is evident in the way the story goes ahead without pausing or flagging at any time. The author dips into her background of science to place her narratives in fresh landscapes as she talks about loss and grief, obsession, infertility, poverty, privilege. We read about embryos that grow inside purple colored boils, neighborhoods that are expanded by cutting and inserting a piece of land, a world where the government introduces controlled breeding to increase population. We are introduced to characters that seemingly inhabit a normal world yet find themselves in the midst of strange situations, surreal and unexpected. In the story, ‘Lennard-Jones Potentials’, the narrator, one of the twin girls born out of a petri-dish union, wonders about likely names for her discarded sibling-embryos. As the girl ponders the reality of her existence, the author provides the explanation for the title of the story. Abuse, bullying, the subtle ways in which the caste system operates, exploitation of privilege by urban dwellers are some of the other themes that the author explores in the book. In ‘Should I Weep’, the anguish of a child who’s picked on by students as well as teachers, is told against the background of the demise of a teacher. The writer subtly talks about patriarchal attitudes and the different ways in which abuse may be surreptitiously perpetuated in the stories, ‘Intensive Care’ and ‘The Perfect Shot’. One of the most interesting stories that I kept going back to was ‘Any Day Now’. A young woman returns to her paying guest accommodation to reconnect with her host when her life hits a bleak turn only to realise that her erstwhile hostess has undergone a transformation and she must now distract the woman from the woes of her domestic help towards herself. Stories with a sci-fi background appear in between those that deal with other issues. The frequent hop between genres is a bit disconcerting. However, the excellent command of the author over the narratives helps the readers enter the different landscapes quickly. As the title indicates, the stories in this collection deal with the many kinds of transformation that can happen as a result of unforeseen circumstances, instances when the matter and manner of change are governed by both internal and external forces over which the characters have very little control. Chandrasekhar’s subtle and nuanced narratives throw light on deep relationships formed beyond the bond of blood, reflecting on the diversity and versatility of human interactions. 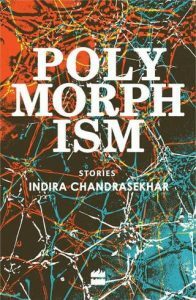 Polymorphism is a beautiful collection of short stories that any good lover of fiction will enjoy. This set of short stories introduces the readers to different versions of reality and opens space for emotional growth. Polymorphism is a collection of nineteen short stories based on the ideas of variation and transformation. Thematically, the stories are loosely grounded upon emotional regeneration, growth, restoration and loss, expressed through narratives which are mostly open-ended. Smoothly paced, they begin with a sense of familiarity and end in strange realities, leaving the reader surprised. A biophysicist by profession, Chandrashekhar, even as she creates a parallel reality for the readers, is in total control of the strangeness of her fiction. The collection opens with the story “Polymorphism”. The story revolves around Charu and her metamorphosis into a non-human entity with practically no control over her physicality. She is deeply remorseful at having hurt her two kids. This manifests by way of her body floating mid-air. The strange experience of transforming into a thing and losing herself, leaves her deeply perplexed. It makes for an interesting read. “Adoration”, another story in the collection which features in the anthology, tells us Devpriya’s story from the perspective of the protagonist. It is a typical Bombay romance — a Bollywood star, a slum boy-lover, vanity, and conceit. Polymorphism, a speculative fiction, contains both utopic and dystopic themes. “Embryotic”, for instance, reminds one of Brave New World by Aldous Huxley. It is the tale of a woman who is first acquainted to the embryotic state of her house-help by a purple boil on her hand which later grows into an embryo, leading to the birth of a child. All of this is very enchanting for the protagonist. It makes her embark on her own quest to experience an embryotic growth. Despite being told not to be a part of the embryotic cult, she gets her own embryotic plant. And a new kind of reality takes shape. “The Shift” takes its readers to a perfect setting in the life of a couple. An open-ended tale, it leaves the reader wondering what really happened in the magical waters of the beach. Chandrashekhar narrates each of her stories with comparative ease. The author’s held back style of writing makes it a very interesting read. Overall, the writing is concise, meaningful, fresh, modern and to the point. A terrific mix of social and biological facts, the stories are easy to read and understand. Most of the tales are woven around the daily lives of the characters and the descriptions have neither too many nor too few details. One of my personal favorites is “The Insert”, which reminds one of the film The Equilibrium, a dystopian science fiction that tells the story of Christian Bale, an enforcement officer under a regime where fundamental rights are outlawed and people are barred from feeling or expressing emotions. “The Insert” creates a similar environment as the plot focusses on an insert which is to be added to the motorway, with no information given to the characters or the readers about the authorities implementing the experimental expansion. A man disappears in the dark hours and a woman is left wondering what happens after the expansion. Chandrashekhar’s stories have an ethereal feel to them. Fascinating scientific phenomena are mixed with mundane everyday settings in these stories. This combination makes Polymorphism oddly intriguing. Some of her stories have very unique endings. “The News”, “My Kitchen My Space”, “Abandoned Rooms” and “She Can Sing” are cases in point. “My Kitchen My Space” describes a stereotypical joint family situation where a certain housewife bears constant humiliation at the hands of her mother-in-law. The old lady’s constant bickering takes a toll on Maya and leads her to react in a way most readers would find challenging to understand. Polymorphism is unpredictable and original. These are stories based on preexisting conditions and scientific phenomena which take on surreal twists. The reader keeps trying to guess the ending and each time, the ending is beyond what they would have imagined. This collection has a hint of magical realism, something Gabriel Garcia Marquez had mastered. It’s like a gateway to another world and it is mature and enjoyable at the same time. It deals with fiction and particularly with art in a way that one does not feel guilty of reading something which might temporarily transport you to another setting and take you away from your own reality. Instead of a familiar setting in the physical, the book takes you into an almost etheric journey with no guilt of having invested in a respite, for it creates its own world which seems very much real.